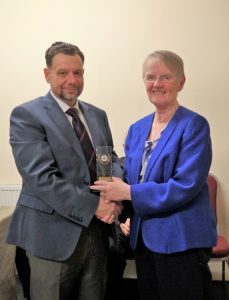 Llantwit Major Town Council wish to congratulate all the Winners and Runners up of the 2019 Awards Ceremony held on the 6th April 2019 in Llantonian Hall. An evening of laughter and tears celebrating our unsung heroes of our town. 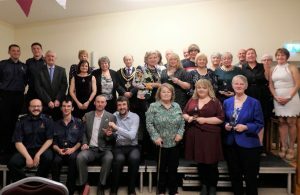 Detailed below are all our worthy winners that volunteer their time and energy to make our Town so special. SPORTS PERSONALITY OR TEAM OF THE YEAR. BUSINESS OR ORGANISATION, SERVICE TO THE COMMUNITY AWARD. AWARD FOR OUTSTANDING FUNDRAISING FOR CHARITY OR LOCAL ORGANISATIONS. 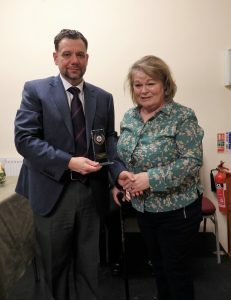 The award for Citizen of the Year 2019 is to be presented to two people who have worked tirelessly and passionately for their local organisation. 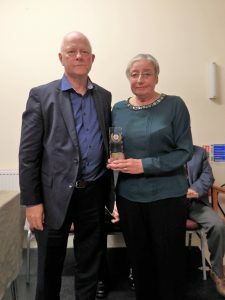 The winners of the Citizen of Year Award 2019 is given jointly to Maureen Geary Andrews and Heather Fox. Some years ago Maureen volunteered to become Treasurer of the Llantwit Major Branch of the Royal British Legion. She was eventually persuaded to take over the Secretary role of the branch and Heather then joined the organisation as Treasurer. Both ladies have worked so hard since taking on these roles to ensure that Remembrance Day in Llantwit Major is always a very special, memorable event. Maureen and Heather spend hours distributing and collecting poppy boxes throughout the town. Weeks before Remembrance Day they can be seen in Filco Food Stores selling poppies and memorabilia to raise funds for the British Legion. They have over the last few years been responsible for ensuring that the Remembrance Parade is organised correctly and all relevant dignitaries are invited and the parade and service follow the correct running order. The Town Council would also like to thank them for all their support with the Nations Tribute Celebrations in 2018. Out of the public eye they spend hours in front of their computers dealing with the vast amount of paperwork and financial matters their roles entail. It is our firm belief without the commitment of these two hardworking ladies the local branch of the Royal British Legion would not be in existence today. 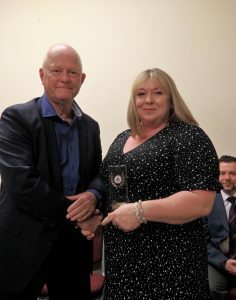 The Runner Up of the Citizen of the Year 2019 goes to Mrs Sheralee Baldwin. Sheralee has for many years been the warden of Crawhay Court, a sheltered accommodation for the elderly in Eagleswell Road. She is a kind, thoughtful, professional person and her commitment to the residents extends way beyond her job description. She makes meals, pops in and sees residents at all times of the day and weekends. She ensures they get their prescriptions and acts as a Carer and friend to many of the vulnerable residents. She is always pleasant and accommodating to all visitors and always has time to speak to the relatives of the residents. Sheralee herself suffered a major illness herself and has shown great determination in getting back to health to continue to look after the residents of Crawshay Drive. Sheralee works extremely hard, and is an example to us all. Her dedication to her work along with her caring personality makes her thoroughly deserving of this award. 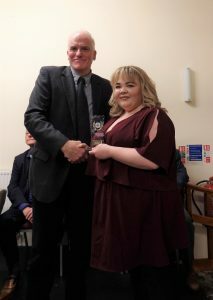 The Runners Up Award for 2019 is presented to Morgan Edwards. Morgan is 17 years old and from 5 years of age has been a member of Llantwit Major Boys Brigade. I have been told his commitment to Boys Brigade, especially over the last few years has been wonderful to witness. 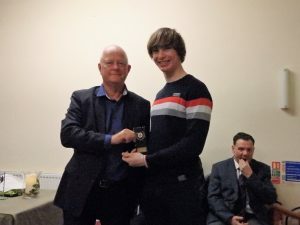 He gives up his time, not just on Meeting nights but to support the Company in National Competitions such as Master Team, Chess and Table Tennis. He actively fundraises for the Boys Brigade and regularly takes part in Community Events. He is turning into a natural leader who supports those around him. Other boys look up to him and try to follow his example. As well as Boys Brigade he is Captain of the Lifeguards. These roles he fits in while continuing his academic studies. The future of our community is bright with young people like Morgan as part of it. 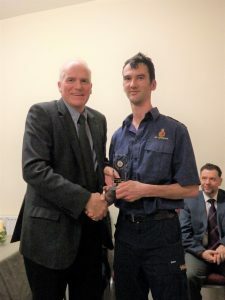 Many congratulations Morgan on a deserving award. The Winner of Young Citizen of Year Award is presented to Jake Fairchild. Llantwit Major Tennis club nominated Jake for this award. 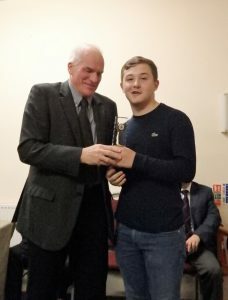 Jake has always been a thoroughly impressive young person ever since his arrival at the club however this year his conduct and achievements have been nothing short of an inspiration to all at the club and all the Tennis Club are very proud to have him as a member and a friend. Jake is Head Boy this year at Llantwit Major Comprehensive School. He is also a mainstay behind the counter of the local Chinese takeaway and is always welcoming and good humoured. He regularly represents the Tennis Club in the Seniors Men and Mixed Teams in the South Wales League. This summer he and his partner Fraser Prior won the Clubs Men’s Senior Doubles tournament for the second year running. These achievements are all very well and good but what is so impressive is the way Jake coped with the tragic passing of his mother. For a young man to behave with such dignity, strength and maturity was truly inspiration to witness. Jake showed true desire and commitment to win the Doubles trophy, to take home to show his Mother, before she passed away. Jake has always been a good humoured, fun loving helpful and kind young person. However to see how Jake has grown this year to achieve so much and still remain his humble, good natured self should be a lesson to us all. Jake you are a credit to your family, your school and town and deserved to be named the 2019 Young Citizen of the Year. 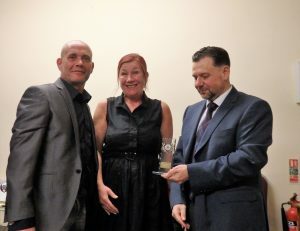 The Runner Up of the Sports Personality of the Year 2019 is awarded to the Major Milers Running Club. The Running Club was established in 2017 to enable local people of all ages to improve their physical fitness by running in a group within the community. The Club has over 700 Facebook members and regularly attracts 50 + runners on Tuesday and Thursday night sessions, even on the dark, cold and wet winter nights! Numerous members represent the Club at local races and many travel further afield for a race. A few members have taken part in the London Marathon raising significant amount of money for their chosen charities. The Club has improved the health, physiological as well as mental well-being of all those who have run. It has become a real social group for the town and reaches out across the community from young adults to retired senior citizens. 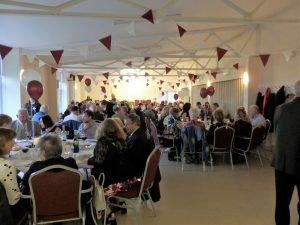 The Club is run by a dedicated, hardworking group of individuals including Martin Hignell, Simon Jones and Caroline Robsen-Glen, They not only organise club nights but have arranged sponsorship for the Club. They also have arranged for members to attend Run Leader Courses and First Aid Courses to ensure the safety of Club Runners. 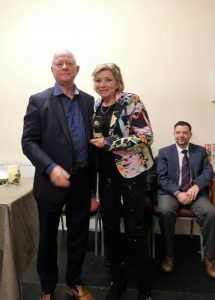 The Major Milers continue to make an outstanding contribution to the town and are deserving of receiving this award despite only being up and ‘RUNNING’ for over two years. An amazing achievement. Well done. The winner of the Sports Personality of the Year 2019 Award is presented to Tracy O’Callaghan. Tracy has represented Great Britain in Powerlifting during 2018 in the European Masters Championship and World Masters Championships. At the end of 2017 Tracey qualified to represent Great Britain at the European Masters Championship in Sweden. Tracy came away with silver and three gold medals which included the overall gold to crown her as 2018 European Champion. At this competition she also attained the British and European record in the squat lift. Tracy was then selected to represent Great Britain in the World Championships in Calgary, Canada in June 2018. The competition was tough but Tracy came away with fourth overall and a silver medal in the squat lift and a Commonwealth record. To end the year Tracy went to Belfast and won the British Master Championship which leads to automatic selection to 2019 European and World championship. Tracy is highly dedicated to the sports and trains at least three times a week at Force Strength and Conditioning in Llandow. This she fits around family life and running a successful playgroup in the town. The sport is self-funded, even at international level, so the support and funds raised by Llantwit Major Community, I know Tracy greatly appreciates. Tracy has raised the profile of the sport in the town and on the international stage. She is an inspiration to many and is totally worthy of this award. Congratulations on your amazing achievements so far and we look forward of hearing of your further successes in future years. The Runner Up of the Business/Organisation, Service to the Community Award is presented to Llantwit Major Coast Guard Team. The Coast Guard team are made up of at present 12 volunteers who provide an emergency service to keep the coastline and beach safe. . As well as this they provide support to other emergency services and the local community and are involved in local events including the Llantwit Major 10k, beach cleaning and the RAF Freedom Parade. In 2018 the team spent 1100 hours training and practicing their skills both in rope rescue search and water rescue. The team responded to 59 emergency calls and spent a further 700 man hours at the scene of incidents. As well as all this they provide educational information to local schools and have raised over £900 for charity by taking part in various runs ranging from 10k to the Newport Marathon! Based in the heart of Llantwit Major Community at Llantwit Fire Station they provide a fully professional service to the Town. A group of volunteers totally committed to keeping our coast and town safe whilst juggling their own full time jobs and family commitments. The Llantwit Major Coast Guard Team is thoroughly deserving of this award and as a town we must thank them for all they do for our community. The winner of the Business/Organisation, Service to the Community is presented to Llantwit Major Dementia Café. 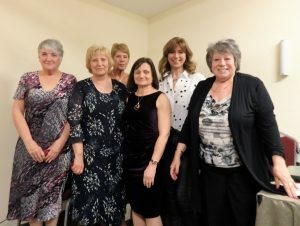 The team of Teresa Mcquire and her volunteers Pat, Renee and Val works tirelessly to run a Dementia Café in Bethel Baptist Hall for those suffering dementia and for their Carers. One person that nominated them for this award stated that the team provide tea, cake and entertainment but that is the easy part. More importantly the team understands the effects of the progression of dementia often over many years, starting with the inability to recognise money to the advancing parts if the illness when they can no longer recognise their family and surroundings. Another nomination form stated the team always gave 100% of themselves to the cause and although they too have health issues never complain and are always cheerful. The person stated that they were always greeted with a smile or a hug and this, as a Carer for eight years, is very special and and if they didn’t make one of the sessions Teresa will ring them up to see if they are alright or help with any problems they may have. Without Teresa, Pat, Val and Rene the fortnightly Tuesday afternoon get togethers would not happen. The Carers stated they would miss going out to meet people who understand their problems and provide a shoulder to cry on, when needed. The Llantwit Major Dementia Café team give up their time to help others, are welcoming, understanding, supportive and provide a service to both the Dementia Sufferers and their carers. They provide essential support to those facing this traumatic illness and are thoroughly deserving of being winners of the Service to the Community Award. The Runner Up in the category of Outstanding Fundraising for Charity is awarded to Toni Marley. Anyone who travels up or down Eagleswell Road over the Christmas period cannot help but smile as they pass Briarwood Bungalow. The Christmas display in the garden gets bigger and better each year. It takes Toni up to 5 weeks to put up the display and she is sourcing Christmas lights and decorations all year round. She started the idea a few years ago with aim to raise some funds for charities close to her heart. Since then the displays have grown as well as organising a Father Christmas ‘Grotto’ for local children. In the last 12 months she has raised over £3000. 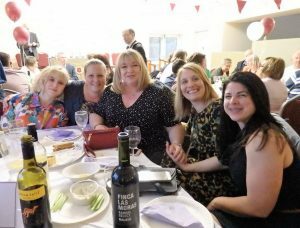 The money raised has gone to various charities including ‘Health in Adolescence’, Action for Children’ and the ‘Neo Natal Unit’ at the Heath Hospital. 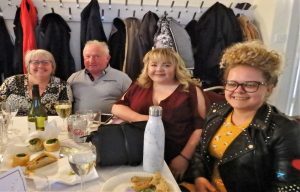 Toni has also fundraised to assist Tracy O’Callaghan, also here tonight, in raising funds for her trips to International Power lifting competitions. She has also recently agreed to assist with fundraising to help with the Christmas Illuminations in Llantwit Major for 2019. Well done Toni on all your amazing fundraising and thank you for making every ones Christmas in Llantwit Major little bit more special. The Winner of the Award for Outstanding Fundraising for Charity/Local Organisation is Amber Snell. Ambers has worked tirelessly and passionately over the last few years to raise funds for the Alzheimer’s Society. A cause close to her heart following the sad death of her Grandfather to this illness. She has held regular bake sales which has grown bigger and better each year and has raised over £3000 for this worthy cause. Amber works so hard to promote the Alzheimer’s Charity and does all this whilst working full time. She is also organising a Bath Christmas Trip and any proceeds from the trip will be donated to two local charities the ‘Memory Jar’ and Llantwit Major Dementia Cafe’. For such a young person of only 25 years of age, to be so committed to a cause which normally affects the older generation is something to recognise and hence why she is the winner of this Award. Well done Amber and good luck with your next venture to help raise funds for the Christmas Illuminations in Llantwit Major. Last year saw Llantwit Major celebrate a Nations Tribute, 100 years since the end of World War 1. As part of the celebrations the Town Council invited individuals, groups and organisations to take part in producing a Commemorative Decorated Patchwork Wall Hanging. They were asked to knit/sew/paint a poppy on a square 8” by 8”. Over 400 squares were returned to the Town Hall. It was then the amazing Poppy Ladies, as they become know, who spent hours working together to stich the squares together to form the Patchwork Wall Hanging that is now on display in the Town Hall. The time and patience these seven volunteers took to create such a memorable Hanging is a credit to the community and we as a Town Council feel they should be rewarded for all their hard work. Therefore please could I ask Meryl Hunter, Loraine Savory, Janet Birt, Coleen Tombs, Sheila Reynolds, Sue Fraser and Jacquie Jenkins to accept a small gift as a token of the town’s appreciation for their efforts in making the Nation Tribute such a memorable event for our town.